Keith Gray, You Killed Me! 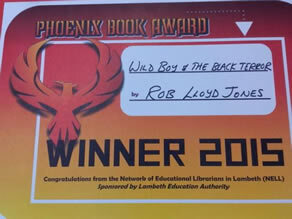 The Phoenix Book Award promotes reading for pleasure among Year 6 and Key Stage 3 pupils in the London Borough of Lambeth. Inaugurated in 2007 by the Network of Educational Librarians in Lambeth (NELL), it is open to all schools in the Lambeth area. For further information contact Karen Hans, Lambeth Lead Librarian. Pupils from Archbishop Tenison, Dunraven Secondary School, Elm Green Secondary School and St Martins in the Fields School for Girls had the responsibility of selecting and voting for books from a longlist of 36 titles to become this year's shortlist nominees. The winner will be announced on 1st May 2014. NELL are very grateful to Sandra Davidson, Lambeth Public Libraries, for organising and hosting the finale.